This is the easiest way to select your Bookshelf Plus eBook and mp3 audiobook titles from DeseretBook.com. In order to access the books for free, always make sure you are selecting the orange "Free with Plus" buttons, and not the green "Buy Now" or "Add to Cart" buttons. Steps 1 through 4 are easiest and best done on a computer. 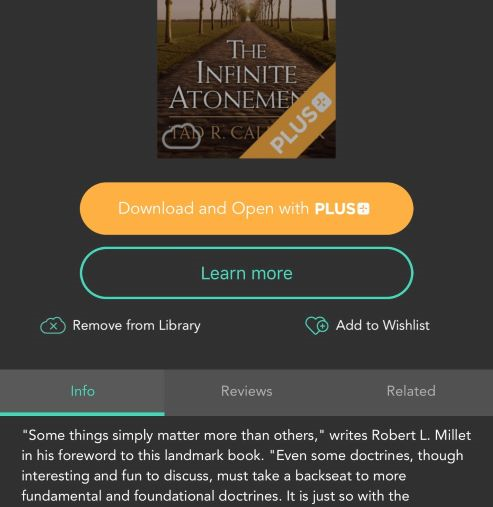 Make sure you are logged into your account first on DeseretBook.com for the yellow "Read Free With Plus" and "Listen Free With Plus" to show up for you. If these buttons are not showing up, make sure you are logged in. If you receive an advertisement asking you to sign up for Bookshelf Plus, even though you are already signed up, it means that you are not logged in. Please make sure you try logging in if you see this message. 1.Make sure you are in a place with a consistent, high speed wifi/internet connection. 3. Tap or click on "Login" in the upper right corner and login with your email login ******* and your Deseret Book password. 5. If you are in a place with consistent, high speed wifi/internet open the Bookshelf app on your Apple or Android device (or if it is already open close the app and open it again) to get your new eBook or mp3 audiobook to sync into your list in the DB app on your Apple or Android device. 1. Make sure you are in a place with a consistent, high speed wifi/internet connection. 2. Using the "Search" function or browsing the Discover page, find a book that has an orange banner across the cover that says "Plus". Audiobooks will be indicated with a green icon of headphones in the top right corner of the book cover. 3. Tap on the book you wish to download. 4. Tap "Read free with Plus", "Listen free with Plus", or something similar. 5. The book will then begin to download to your Library. Please be careful when accessing Plus content. Deseret Book's policy is that we cannot issue refunds for digital products (eBooks, auidobooks, etc). If you select "Buy Now" or "Add to Cart", you will be purchasing that content, and Deseret Book will not issue a refund. If you wish to access Plus content for free, make sure to not add it to your cart. Rather, follow the instructions above and always select the "Free" buttons. We hope this is helpful and works for you.